Property Info: 2 Bedroom, 2 Bath beachfront unit, sleeps up to 6. 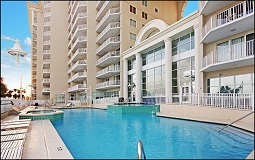 Destin FL Beachfront vacation rental at Majestic Sun condos. This beach resort property offers HDTV’s, WiFi and a discount on Beach Service to compliment the exceptional amenities and panoramic views of emerald-green Gulf of Mexico waters & magnificent sunsets.